After five years of grassroots activism, including protests in nearly every state, lobbying members of Congress on Capitol Hill and in home districts, and generating tens of thousands of calls, emails and letters, CWA activists and our broad coalition defeated the Trans-Pacific Partnership trade deal. Many economists, pundits, and congressional voices said we couldn't do it, especially after Fast-Track Authority was passed. Our historic campaign proved them wrong. CWA made the TPP a major issue in the 2016 presidential election campaign, with both candidates declaring their opposition to the deal. This long effort to defeat the TPP shows us that when we mobilize and join with allies we can win, and we can ensure that the needs and interests of working families are addressed. Defeating the TPP will help keep good jobs here in the U.S., keep our food safe, ensure that the laws we support, like "Buy American" and others, remain in force, and remove the threat that international tribunals can overturn the will of the people. CWA President Chris Shelton said, "For more than five years, CWA members, allies, and working families mobilized to expose this corporate-friendly, job-killing trade deal and the serious consequences for working families and communities if it was put in place. 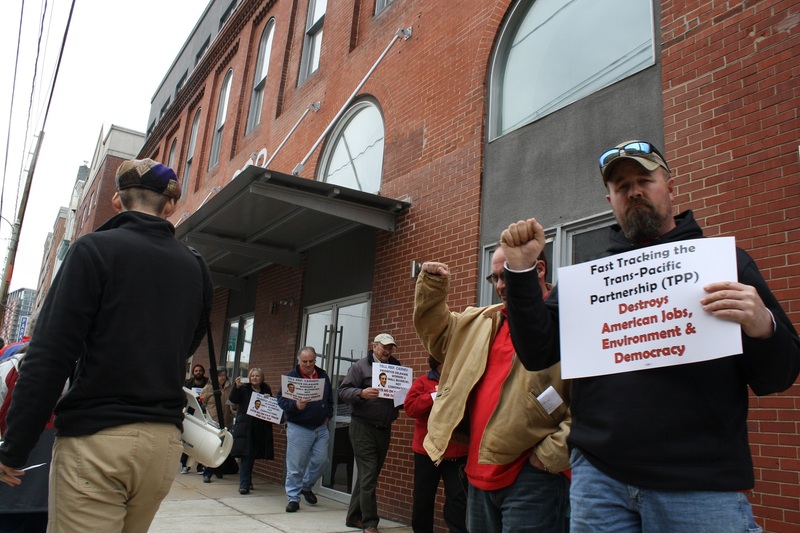 Our members long have been ahead of Washington on the issue of the TPP and fair trade, and our work built a strong base of voters who rejected what they clearly recognized as a bad deal, no matter their political party." "The very same forces that lined up to pass the TPP will not rest, however, and we should consider everything we have done as good practice for the next four years. We are ready to fight." It was former CWA President Larry Cohen who pushed the labor movement to fight the TPP, and who built the diverse coalition that stood against the deal. That led to the historic ban adopted by all AFL-CIO unions on political contributions to candidates who supported Fast-Track for the trade deal. Cohen was convinced that every meeting with a Member of Congress and every event needed the participation of workers, environmental activists, people of faith, community and civil rights leaders, everyone who had a stake in making sure that the TPP didn't pass. CWA activists reported that this made a big difference, especially in meetings with senators and representatives who realized that they faced united opposition to the deal. The significance of this victory is huge. This is one of the few times that a trade deal sought by multinational corporations, the U.S. Chamber of Commerce, and the President and key administration trade officials has been defeated. On Capitol Hill, Representative Rosa DeLauro (D-Conn.), who led the fight in Congress against the TPP, and other Democratic Members of Congress held a news conference, stressing that the defeat of TPP marked "the end of an era for trade agreements that are drafted hidden from the public view." "Together, a strong coalition of Members of Congress and labor, environmental, faith, and human rights organizations and activists worked diligently to stop this agreement. The TPP meant more power for corporations and fewer good jobs and lower wages for American workers. Since it was signed in February, it could not garner a majority of support in the U.S. House of Representatives," DeLauro said, adding, "TPP was on the ropes long before last Tuesday."